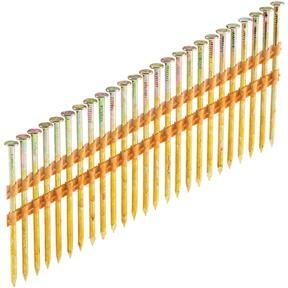 3" 20-22 Deg Round Head Framing Nails, 4000 pc. Grizzly G6097 - 3" 20-22 Deg Round Head Framing Nails, 4000 pc. These 3" 20-22° Round Head Galvanized Framing Nails fit the G6050, H7665, H7943 and Dewalt D51845 framing nailers. 4000 pc. I purchased these for a side job replacing some sub-flooring. they work well, and when rack does break, the partials still shoot without jamming or misfiring.